1) Donate what you can. 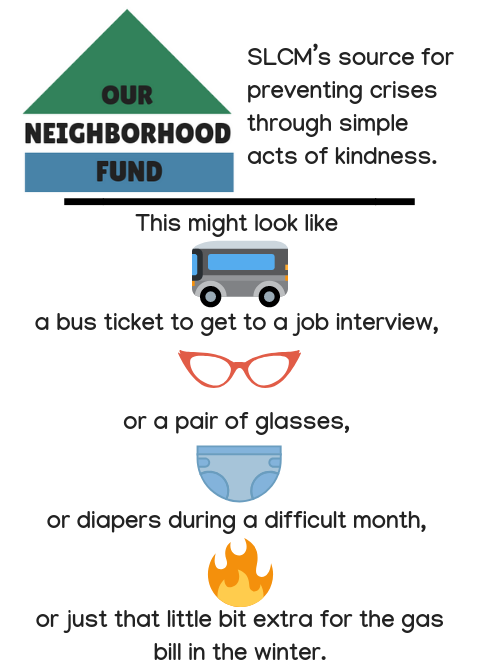 2) We meet with your neighbor who could use an act of kindness. 3) Your donation is transformed into the very thing that will help them move toward a safe, healthy and happy home. It will help cover the comparatively minimal cost of these crucial items and time-sensitive bills as well as the related supporting service costs. We believe in transparency and communication so if you have any questions, please do not hesitate to contact us. SLCM has had to turn away almost half of the people who come to us asking for emergency assistance due to the lack of resources. We're asking for your help today to better serve our community. Community is asking for help when we need it and knowing there’s people to support you when you do. This is also the greater purpose of faith communities; An insurance policy that’s built on compassion. South Louisville Community Ministries takes on that mission regardless of one’s membership or spiritual beliefs. But this work is only as strong as the community that supports it. South Louisville Community Ministries is a 501(c)3 non-profit organization EIN #31-0891259.